We invite all graduate students across the disciplines to apply to participate in an “experimental classroom” as part of the Bonham Centre’s annual Queer Directions Symposium. Each year, Queer Directions features innovative developments in queer studies, focusing on emerging and vital themes and critiques. This year’s topic is Trans/Formations. The professors and artists leading the classroom are: Aren Aizura (Associate Professor, University of Minnesota), C. Riley Snorton (Professor, University of Chicago), Morgan M. Page (writer, artist, activist, and host of the trans history podcast One From the Vaults), and Alok Vaid-Menon (performance artist, poet, and LGBTQ rights activist). 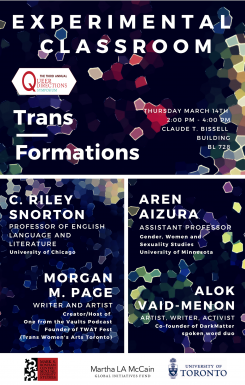 This is an opportunity to discuss ideas and share work with some of the most important artists, activists, and scholars in the fields of trans studies, intersectional queer theory and performance, gender studies, transnationalism and diaspora, and critical race theory. The classroom will be held on March 14th, from 2pm-4pm, with location TBA. Applications open on February 4th and close on February 25th. Applicants can expect to hear back by March 1st. To apply, please fill out the form below. Please use the form below to submit an application to attend the Queer Transnationalisms and Queer Diasporas Experimental Classroom. Please note that participation is limited, and that submitting an application does not guarantee your participation. Are you currently enrolled in the SDS Collaborative Graduate Program?